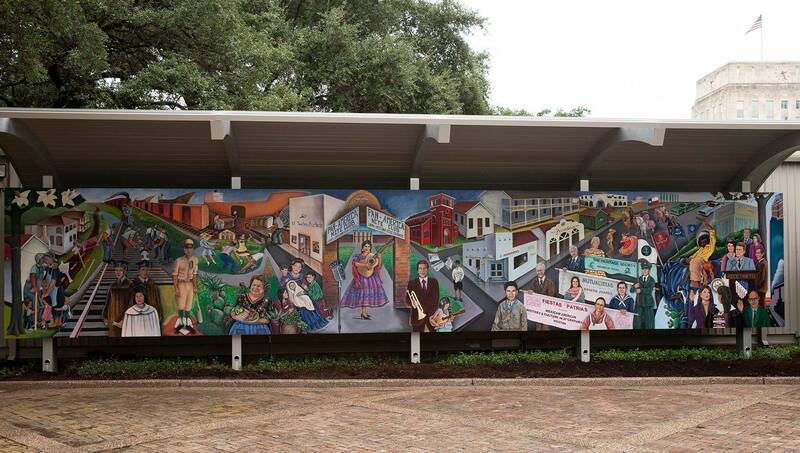 The Heritage Society at Sam Houston Park recently unveiled their latest historical work of art, the mural by artists Jesse Sifuentes and Laura Lopez Cano Mexican-American History & Culture in 20th Century Houston. Commissioned by The Heritage Society in celebration of the many contributions made by Mexican-Americans in the City of Houston, the first-of-its-kind mural was officially unveiled to the public earlier this month. Mural themes include Mexican immigration as people fled the Revolution at home, the jobs that the new immigrants took on the railroads and in Ship Channel industries, life in El Segundo Barrio, community institutions and the all-encompassing importance of extended family in the life of Mexican-Americans. Key Hispanic figures were included as well. Set against a backdrop of City Hall and the downtown skyline, this mural is a cultural landmark and prime photo opportunity in the very heart of Houston.